Goodwill Engineering in partnership with the Perth Region NRM and EcoAdvance have implemented a range of energy reduction improvements to the Malaga work site. This will show our business partners and the community the importance of being proactive in reducing our carbon footprint. Goodwill was asked to partner Perth Region NRM in an energy audit of a medium size manufacturing business within the City of Swan. This Level 2 energy audit was conducted at Goodwill Engineering the production and employment arm of the Ability Centre. The aim of this energy audit was to analyse the energy usage at the business and make appropriate recommendations for better energy efficiency. There is a wide range of machinery which are utilised for manufacturing products from black, stainless steel or galvanized metal etc. These include a plasma cutter, manual and robotic welders, large presses, wire making machines, and other general machinery. Most of these use electricity directly, while some of them are operated by compressed air. Two compressors are in operation at Goodwill – a 37kW compressor for general use and a 7.5kW compressor, dedicated for use with the plasma sheet-cutter. An old 37kW compressor is reserved for emergency cover. A myriad of systems are used for heating, ventilation and cooling. The main workshop is cooled by evaporative air-conditioners and heating is provided by radiant gas heaters, suspended from the ceiling. A ducted reverse cycle air-conditioning system services the main offices, but there are also additional split-systems in the conference and meeting rooms. The lunchroom has separate air-conditioning in the form of 4 split systems. The change rooms and toilets share a timer-operated extraction fan system. There is a large variety of lighting configurations on site, but low efficiency mercury vapour high bay lighting is predominantly used in the main and welding workshops. Natural lighting in the workshop has been drastically improved with the recent replacement of old translucent roof panels with new ones. Lighting in the offices are mainly fluorescent tubes, with some halogen down lights in some areas. 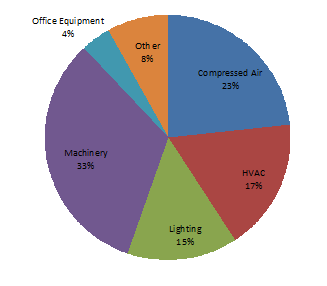 Other areas of major energy use include office equipment (e.g. computers, printers, photocopiers, etc) and amenities (e.g. hot water, refrigeration, etc). The energy audit provides an insight into the energy use at Goodwill by identifying and analysing the major areas of consumption. In this way, the most efforts can be directed to make the most energy and cost savings at least cost. Process- and user-related energy use data is collected by various means, and analysed carefully for this purpose. On completion of the energy audit, recommendations were made for actions to be taken to improve energy efficiency of the business. The annual electricity consumption at Goodwill has been fairly stable in the last two years, at around 230MWh per year (Desktop study report 2009). Figure 1 shows a breakdown of electricity consumption (estimated from information collected during the equipment audit and staff interviews). With a plethora of heavy equipment for fabrication and production, machinery is, not surprisingly, the highest consumer of electricity at 33%. This is followed by 23% in compressed air production, 17% in the area of HVAC and 15% in lighting. Other appliances (8%) and office equipment (4%) make up the rest of the electricity usage.